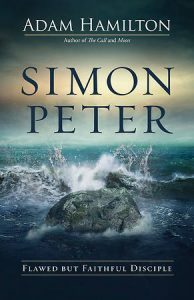 Simon Peter, By Adam Hamilton - An ordinary fisherman who heard an extraordinary call. He was not rich or educated, but was familiar with hard work. He was quick-tempered and impetuous, but possessed a passion that would change the world. He left everything to follow his teacher, yet struggled with doubt and fear. Join Pastor Mickey and author Adam Hamilton in this six-week journey, and take an in-depth dive into life, faith, and character of Simon Peter, Thursdays at 11:00 am beginning January 17th.